Prototype modelers have to become pretty adept at research and some of the common resources I've found that help me include Sanborn Fire Insurance Maps (for industry footprints, track layout), city directories (industry types/names), newspapers (events, often a photo resource). Connecticut residents can access digital versions of Sanborn Maps and the Hartford Courant with a CT State Library Card. Here's a link to the state library's database page where you can find more information about these resources. Of course, I've also mentioned how valuable aerial photos are to prototype research - and I've used those extensively. Apropos the last two days' posts on Wethersfield Lumber Co., these aerial photos haven't been all that helpful. They show the buildings from above, but the photos are shot straight down - so all you really get is the footprint of the building. The lack of photos for Wethersfield Lumber (as well as other industries I want to model) has been a continuing source of frustration. Well, the Blogoverse once again has come to the rescue, in the form of "Haksaw." He submitted a comment to yesterday's blog post pointing me in the direction of photos of damage from the 1938 Hurricane. I knew about UCONN's and the state library's aerial photo resources - and thought I'd mined them pretty thoroughly - but I'd never run across these! They're aerial photos, but with a HUGE difference - instead of being shot straight down, they're taken at an angle (click here for an example) and from this perspective you can at least get some idea of what things actually looked like. The Great New England Hurricane of 1938 (aka The Long Island Express, or more appropriately for a New Haven RR blog, The Yankee Clipper) was second only to Superstorm Sandy in property damage, but remains the deadliest hurricane to ever hit the region. Come September 21st, it will have been 76 years since it made landfall. In the days that followed, these photographs were taken to get some sense of the devastation. Fortunately, up around Wethersfield where I'm looking, the most apparent damage is flood damage. The buildings are still intact. Above is an overview of Wethersfield ("photograph #00026" that Haksaw referred to in his comment). You're looking north and the diagonal line is the Silas Deane Hwy. Waaaay off in the distance, in the upper left hand corner, is the City of Hartford. Note the Traveler's (insurance co.) Tower - and also note how much LARGER it is than anything else in town (a bit of a metaphor, that). Of course, the main thing that strikes you is the flooding of the Connecticut river as a result of the hurricane. And the fact that there are few trees, and everything is so flat. As we zoom in, you can see what is essentially the Wethersfield side of my main peninsula. You can just make out the railroad curving from near the lower right corner, going under water(!) the re-emerging to head straight north (and toward the upper left corner). In that upper left corner? Wethersfield Lumber Co. (unforunately, Ballantine's Beer Distributors wouldn't be built across the street until the next year). Follow the railroad line back south and (barely) make out the Wethersfield station and Gra-Rock at Church Street (near the center of the photo), and then further south, inside that curve of the railroad track, you'll see Valley Coal. That is an absolutely amazing view for this prototype modeler! And, here it is at maximum zoom. The only problem with these photos - and most photos of the era, unfortunately - is that they aren't very high resolution. So you can only zoom in so far before things go all blurry. But this is FAR more visual information than I've had on Wethersfield Lumber to date - and is certainly enough for me to get started on modeling it, with at least some confidence that it'll be pretty darn close to accurate. I'm sure I've said it before, and I'm sure you've heard it said more eloquently elsewhere, but one of the pure joys of prototype modeling (and sometimes it's biggest frustration) is the research you have to do to make sure you're models are just right. And the process of searching for and, if you're lucky, actually finding that information is pretty darn close to time travel in my book. The Eureka! moments like these that happen totally outweigh any frustrations or limitations you might feel when following a prototype closely. Thanks Haksaw for turning me on to this resource. 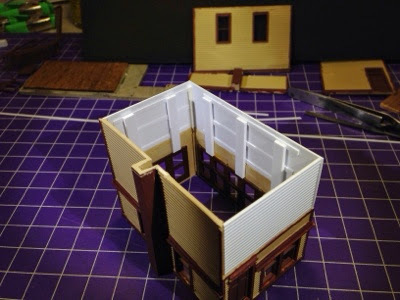 It's certainly given me a great start to modeling the lumber company. Unfortunately, seeing this area being even flatter than I expected, I may end up having to rip out some cardboard lattice and plaster cloth. All in the time of Prototype Fidelity, of course! Have you ever been hijacked? Hopefully, not in the usual, scary, sense - but have you ever had your plans hijacked? After a wonderful (and rare) day of railfanning Friday, I'd planned to get the Middletown Tower done (or just about) Saturday afternoon, and do some airbrushing on some other projects. The Missus and I had a few errands to run that morning, and I'd been planning on getting another dehumidifier for a while anyway, so while we were out I got one. That ended up being a very good idea. When we got home, I decided to empty dehumidifier #1 so I could start it and the new one at the same time (and see which one would collect more water). I've just been dumping the water outside, but for some reason this time decided to dump it in our sump hole back in the oil tank room. As I did, I noticed that the floor was already wet . . . then I looked around and noticed the walls were wet(!)... then I looked some more and realized that a pipe was spurting water up near the floorboards. ARGH! It had already soaked the wall sills and insulation on top of the foundation - in fact, the water was even dripping outside from underneath the clapboards! So, already-long-story short - I turned off the supply to that pipe (fortunately, it's only the pipe going to the outside spigots), got out my wet vac and some box fans - and my handy dandy new dehumidifier. Vacuumed what I could, and put the fans onto the rest. As of this morning, everything is nicely dried out - thankfully. Next thing is to get that pipe fixed. But I didn't get to much modeling - that plan had been thoroughly hijacked. I have a very supportive Missus though, and she wouldn't let me end what turned out to be a crappy day without at least a little fun. So she helped me pick out some paint and I got to work on the tower for an hour or so. The other night, I got a little impatient and glued on the roof - telling myself that it was "necessary to hold everything square." Only slightly true: I actually wanted to see how it would look. Unfortunately, I'd forgotten to put in the window glazing first. So what should have been a very easy job became a bit less easy. Not quite like building a ship in a bottle. Let's just say I'll never put a roof on a structure before making sure interiors and glazing are done first. The photo above shows the tower with the roof & glazing installed and everything ready for painting. We chose colors that I had on-hand that were close enough, if not a perfect match: Floquil Foundation for the walls and TruColor Oxide Brown for the trim. A couple of old contact lens packages for pallets, eye dropper to get paint from bottles to pallets, and trim pieces secured to wax paper by scotch tape. While I have many different varieties of brushes, I decided to use a microbrush to paint since I've found they're not as apt to leave streaks - and you can get really close to the trim without accidentally painting it. 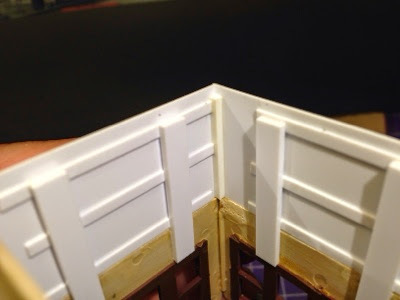 Any unevenness you see in the wall above is the result of the white styrene showing through - but there's no streaking. Actually, I think the effect is pretty nice. The color isn't a perfect match, but I've decided to go ahead and over-paint the original color on the original wall sections - especially because, it turns out, that that color is no "color" at all, but just the original molded plastic color. So the walls will all match when I'm done. 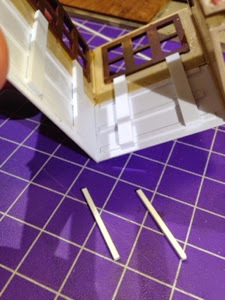 The TruColor paint I used on the trim dries glossy, so I'll have to apply some DullCoat before adding the trim to the structure. That's where things sit as of now. I have to paint the original wall sections and add the trim, and then put the structure back on its foundation and shorten the staircase. Then it's just a matter of adding the tower to the layout - but since Middletown is still plywood-only, I may go ahead and scenic the area around the diamond so the tower will have a nice scene to be seen in. Not bad for an hour's work on Saturday night. Certainly redeemed the day, at least a little. And also fortunately, Sunday was much better. Not only did I catch the Amtrak Exhibit Train going by my house, but I got to go to a picnic with a lot of other folks from the New Haven Railroad historical society (NHRHTA). I even came home with an authentic NHRR shanty stove to heat our photo library/railroad den during the winter months. But I'll post a pic and write up on that some other time. All in all, not too bad a weekend - despite the hijacking! Got home just in time to catch the Amtrak Exhibit Train crossing my street on its way to leaving Valley Line rails (thanks to Roman for the heads up that the train headed south early!). Still in awe at how LARGE this equipment looks compared to what usually is on this line (when anything at all ventures this far south). And it sounds different too - lots of my neighbors came out to see what all the commotion was about. Rocky Hill - Early Wednesday morning (August 17, 1949) a 50-car freight train drawn by two diesel engines passed through Rocky Hill as a result of the derailment of a freight train at Bolton. Traffic had to be rerouted through Middletown and Rocky Hill to Hartford for the Boston to Hartford run. 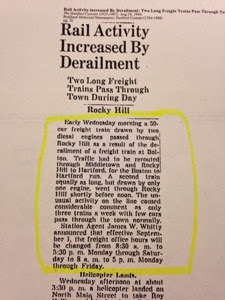 A second train equally as long, but drawn by only one engine, went through Rocky Hill shortly before noon. 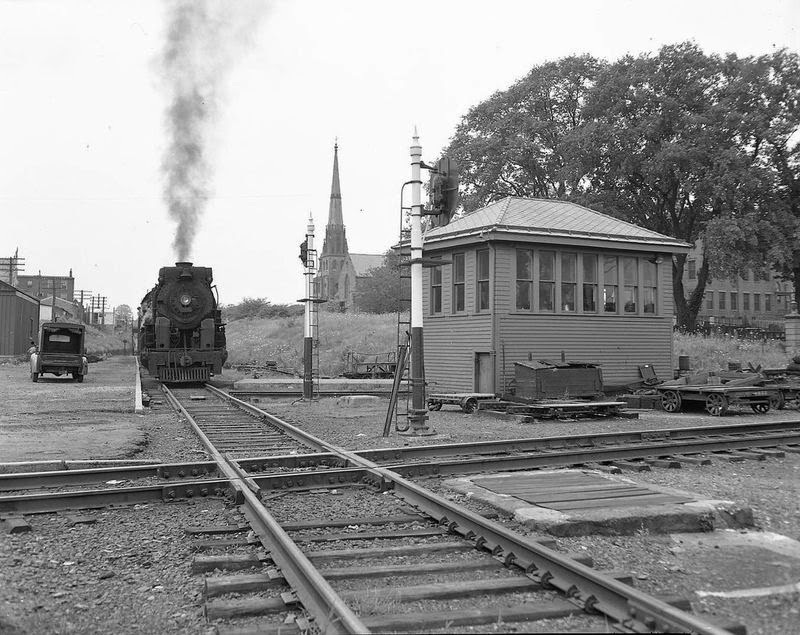 The unusual activity on the line caused considerable comment as only three trains a week with few cars pass through the town normally. Station Agent James W. Whitty announced that effective September 1, the freight office hours will be changed from 8:30 a.m. to 5:30 p.m. Monday through Saturday to 8 a.m. to 5 p.m Monday through Friday." This is not the Valley Local. It's PDX-2, the New London-Cedar Hill (Shoreline) local at Rocky Neck (East Lyme, CT). The date & photographer are unknown, though I suspect the photographer may be Kent Cochrane and the date is likely c. 1947. I include the photo here since PDX-2 during this time served the lower end of the Valley Line, swung off the Shoreline at Old Saybrook and headed up the Valley through Essex & Deep River to interchange cars with the Valley Local at East Haddam. K-1d #363 is doing the honors on what looks like a beautiful summer day, hauling a relatively short - but interesting - train of 6(?) cars. First car is a reefer of some sort, then a wagontop boxcar, outside-braced boxcar, looks like 2 gondolas, unknown boxcar (PRR X-29?) and caboose - most likely an NE-4 wood caboose (which was built on a shorty boxcar frame in the late 1920s). Looks like the fireman is dutifully facing forward, as you'd expect. But just a minute ago he probably took advantage of the fact that he was on the outside of the curve (and thus couldn't see much ahead anyway), and on the correct side of the locomotive to check out all the pretty girls on the beach. You see, Rocky Neck was (and is) a very popular state park with a beautiful beach - and the beach is just out of sight beneath the overpass. Even if PDX-2 didn't figure in my layout's operating scheme, this would still be a great train to model. Heck, this could be a great scene to model, given the distinctive overpass in the background and the beautifully manicured double-track Shoreline mainline (are you paying attention PeteL?). If you don't mind the overpass splitting the scene, you could even model the beach - and the bathing beauties, if you were so inclined (though good luck finding period-appropriate figures). It also wouldn't be too difficult to just have the overpass on the left end of the scene and focus your attention on the beach - just like our attentive fireman. It's photos like these that make prototype modeling (and the time travel that it makes possible) so compelling. Unfortunately, there won't be any room on my layout for any part of this particular scene, but the train itself will definitely play a significant role on the Valley Line. If you're a prototype modeler, you probably enjoy finding where old photographs of your railroad were taken. If you're lucky and the trees haven't encroached too much, you may even be able to replicate the scene. If you're really good, you can then morph between the two photos and see the old view morph into the new view and vice-versa (click here to see how Bill Schneider did this to great effect). Well, today I discovered a way to do that with maps. We prototype modelers rely heavily on maps to show us where our ROW went, what tracks were there, the buildings, etc. But depending on what era you model, things could have - and probably did - change dramatically over the years. If you want to see how, run - do not walk - over to the USGS's Historical Topographic Map Explorer. There you can enter the location you're interested in, click on the map of the location when it pops up, and the software will give you a timeline across the bottom with links to all the maps available for that location, plotted on the timeline by date and scale. I'm familiar with parachuting into old maps online, but now that I've started playing with this new tool, it's really fun to toggle back and forth between today and "the past." Bonus: the older your prototype and the earlier it was abandoned, the more fun it is. So go check it out - but if after seeing the old maps you discover you did something wrong with your trackwork or building placement, don't blame me! 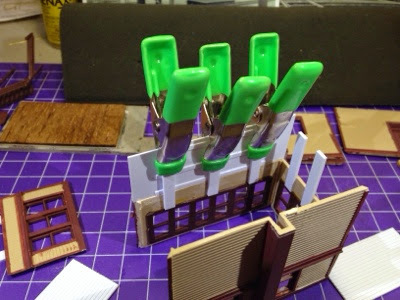 I don't know about you, but I enjoy hearing about what others are doing in the hobby, what progress they're making on their layouts, what they're building, etc. I suspect that may be true for you too and may be why you check in here from time to time. Problem is, blogging about modeling can sometimes be a zero-sum game: if you're modeling, you probably don't have much time to blog about it. If you're blogging, you're not modeling. And, of course, if you're not modeling, you'll eventually run out of blog fodder and chaos will ensue. 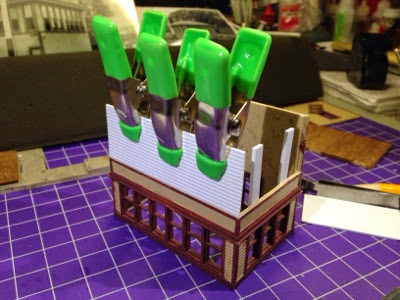 So, I decided to inaugurate a new - though occasional - feature, "What's On My Workbench" - where I'll just take a quick snapshot of, um, what's on my workbench, and give you a little description of what you're seeing & what I'm up to. For me, it'll provide a quick & easy way not only to document my efforts, but to share them with you. 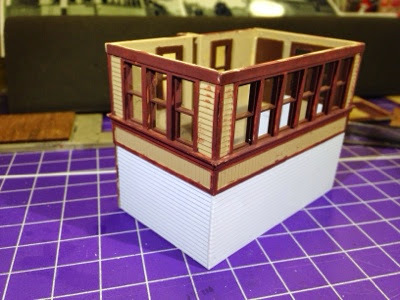 For you, I hope it inspires you to share your own progress photos - or get started so you actually have something on your workbench. C&BT Shops carbodies for New Haven 33000 series steel boxcars. These are the cars I started while on vacation. Yeah, I'm still not done - but getting close. One of the kits was missing a ladder and a truck sideframe, the other was missing weights, the included wheels are godawful and must be replaced, etc. I'll go into the build in more detail in a later post, but suffice it to say that these will just be to fill out my roster a bit for now. IMWX (Innovative Model Works) carbody of a New Haven 30000 series steel boxcar. The IMWX is a much nicer, more detailed kit - and the parts are as delicate as they are beautiful. I'm looking forward to this build, but first step is to remove the warp from the car sides. Strangely, they were bowed out rather than in, as usually happens. A pair of rubber bands will (hopefully) straighten things out. Another IMWX carbody, with the same warp but much less severe. Rubber bands would have been overkill, so I'm just pressing the sides in with some weight. IMWX car roof. Guess what? Warped. But, again, only slightly. I'm hoping a little weight - with the ends supported by matchsticks to allow a deeper counter-bend - will do the trick. Would you do anything different about the warping? I've heard about heating in an oven, but wasn't sure of the right temperature. Those are the major items, though I still am working on modifying a New Haven I-4 tender into a clear vision version for my J-1 2-8-2. And I have to add some sideview mirrors to my MiniMetals Richfield tank truck I just got. Oh - and of course I still have to finish my (now not so) quick & dirty Middletown Tower. 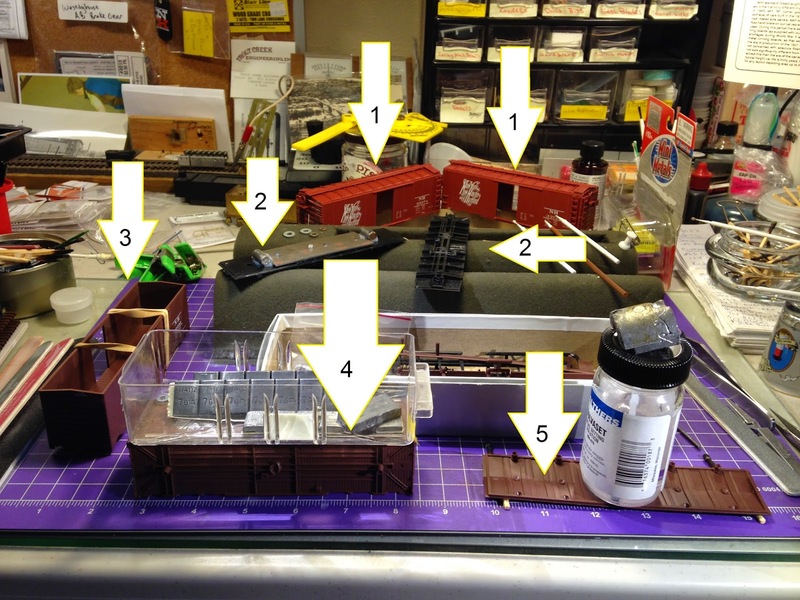 But otherwise, the rest of the photo just shows the usual flotsam & jetsam of the typical modeler's workbench. So, to paraphrase a famous slogan: "What's on your workbench?"